I’m not sure what to name this recipe because I saw a picture of it on Pinterest with no recipe or directions. When I call it a Vegetable Stack, it’s not completely accurate because the stack is sideways. It looks more like a Vegetable Filing Cabinet or a Vegetable Sequence….Vegetable Dominoes??? It was tasty and I would make it again. 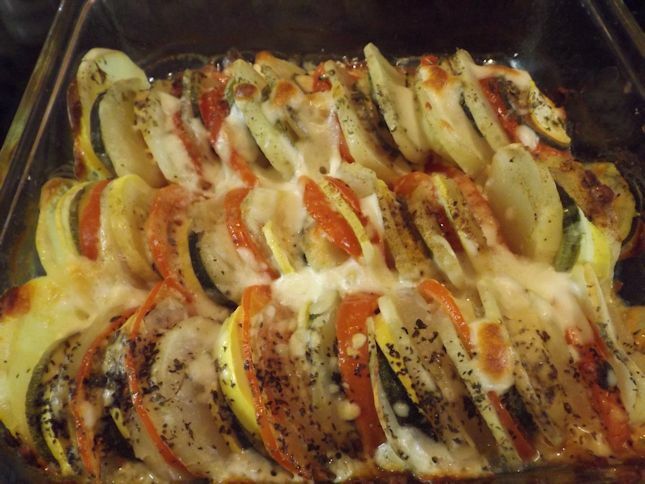 I think mostly it is just appealing looking and a great way to get a variety of vegetables in one dish. 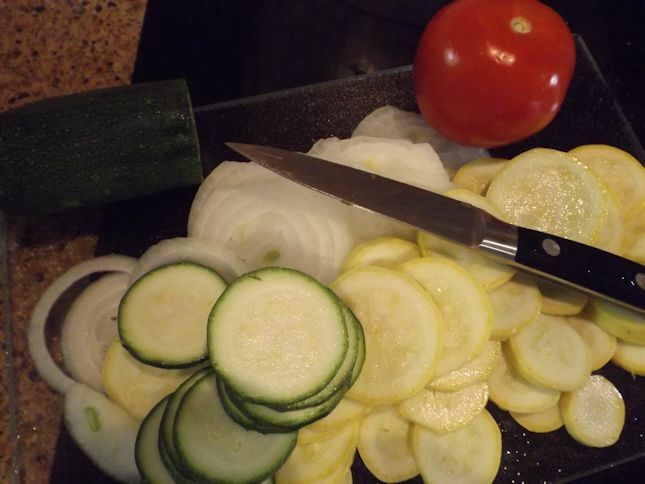 Slice up zucchini, potato yellow squash, onion and tomato. About 2 medium-sized of each. You want the diameter to be similar so the stacks will be an even row. Place a little bit of olive oil in the bottom of a 9X9 baking dish. 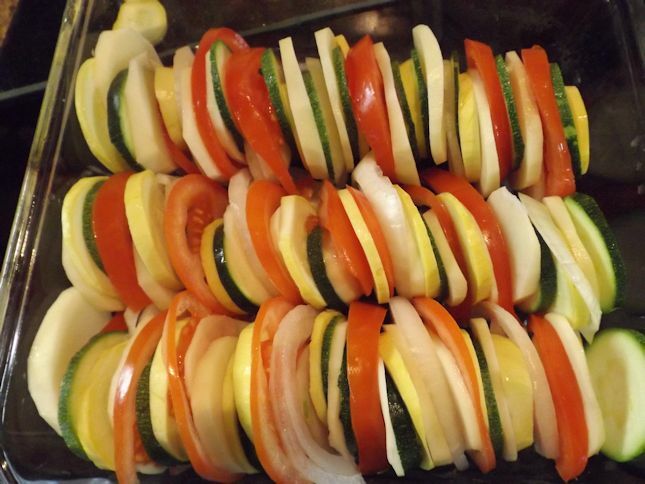 Stack vegetables in rows int he pan. Drizzle with more olive oil. Sprinkle with seasonings – I made a row of basil, a row of cajun and a row of fines herbes. Interestingly, everyone had a favorite but all were good so I don’t think you can go wrong here adding your favorite spices. 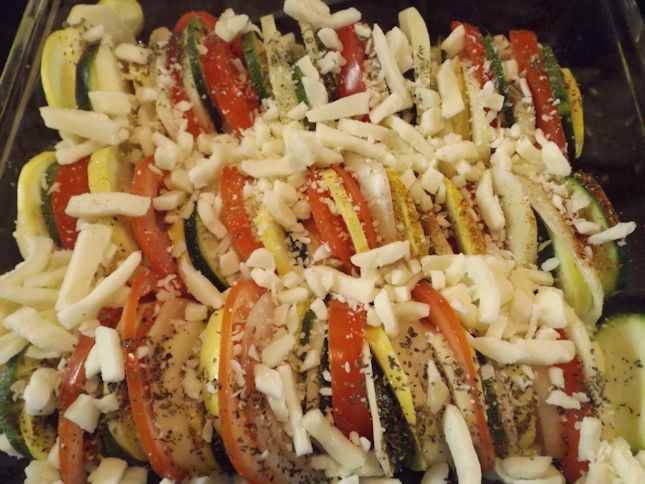 Sprinkle the top with Parmesan or mozzarella cheese or both. Bake at 400 degrees covered for 45 minutes. Uncover and bake an additional 15 minutes. Sprinkle with more cheese, if desired. Thinly slice your vegetables. I did it by hand although I’m sure you could use a mandolin slicer but it didn’t take long to cut them by hand. Save the smaller pieces for another dish. I will show you what I did with mine at the end. Top with your favorite spices and cheese. Bake and enjoy. With my leftover smaller pieces of vegetables, I made a mini casserole. I made a white sauce with butter, flour and milk (salt and pepper). 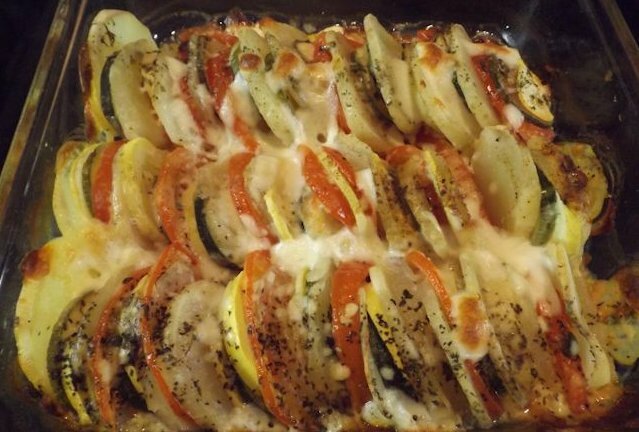 Then I added the vegetables and baked covered for 45 minutes and uncovered for 15 minutes. 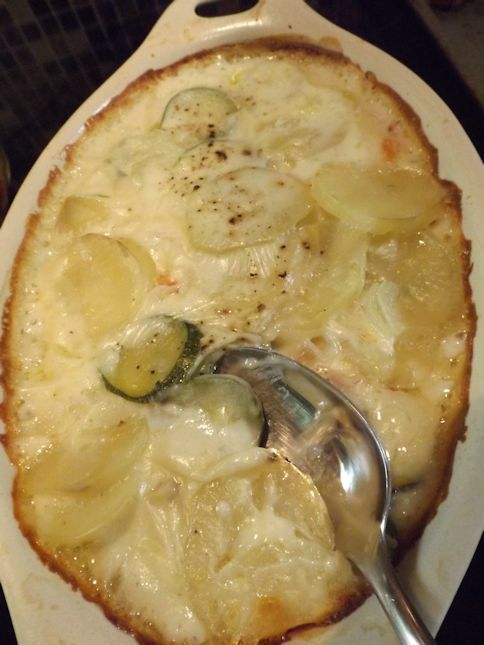 It was similar in taste to scalloped potatoes and was very good.